Summary of today’s show: The parish bulletin is the primary communications vehicle for the church connecting to parishioners. 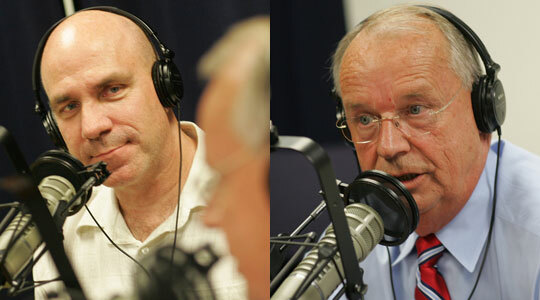 Paul Blanchette and Mike Strong of Pilot Bulletins discuss with Scot how Pilot Bulletins began 10 years ago as ParishComm, their vision for serving the church through their livelihood, and how ParishComm was acquired by the Archdiocese of Boston just one year ago. Also, Scot, Mike, and Paul give their predictions for tonight’s Patriots-Dolphins game and the Patriots season. 1st segment: Scot said one year on September 9, the Archdiocese of Boston purchased a bulletin-printing business called ParishComm that served about 45 parishes mainly in the North Shore and Merrimack Valley. In the past year, they have expanded their service to more than 200 parishes in their printing services and more than 60 who have their bulletins printed every week. Scot welcomed Paul and Mike to the show. Scot said Paul was on the show previously with Fr. Martin Hyatt of the St. Basil’s Cursillo retreat center and Cursillo was integral to the founding of ParishComm. Paul was working in medical sales previously and wanted to find some way to serve the Church. At the same time, he had a friend who developed some parish management software called Church Mouse and Paul started representing the software locally. He found that even though parishes loved the idea, they usually said they couldn’t afford it and would need to have it donated. Then they found that parish bulletin printing generated a lot of revenue that didn’t make its way to the parish and so they determined to sell the bulletin sponsorships and print the bulletins to fund the parish software. The software became ParishSoft, which is perhaps the leading Catholic parish management software. Paul celebrated the 10th anniversary of starting ParishComm, which happened to be 9/11/01. Paul was in Detroit that day with the man he was working with on the software project. Paul’s son was working in New York at the time and was on the phone with him when the second plane hit the Twin Towers. They had been planning to sign the legal papers to start their business, but that didn’t happen. After two days, Paul and an associate rented a car to drive back to Boston. Meanwhile, in the intervening 10 years, the man he was starting the business with, David Rosenberg, has since become a priest of the Diocese of Lansing. At first, there wasn’t a plan to print the bulletins themselves, but eventually they printed it themselves. Paul made his first sale in October 2001 of $354 for an advertising contract. His first church was his home parish, St. Mary in Georgetown. They installed computers and software and used the parish as the testbed. The first year they made $24,000. In their second year, they got their second church. What was difficult was that they were just a couple of guys with a fledgling business and an idea, so they trusted him. They were outsourcing the product and didn’t have control of the printing. It was printed in Michigan and a bad storm could prevent a parish from having its bulletin. So Paul looked into digital printing and the quality was so much better because they could print in vivid color. But that meant lots of infrastructure costs for printers. It was difficult to get past the old habits of parish bulletins, especially getting them to use new covers every week to be attractive and to use the bulletin as a news instrument rather than just a service directory. Digital printing uses large machines that look like office copiers and have the same general functions of a color laser printer in the office. They are different from the more traditional color offset printers, but the quality is similar. Michael said he’s been involved in printing and publishing since the late 1970s after high school, with a detour through military service and working in restaurants. He lived his Cursillo in 2000 and was working at the time in high-end college textbooks on a contract basis. He connected to Paul through Cursillo and was attracted to working in a faithful Catholic environment. Mike continued to work on a contract basis for the Daughters of St. Paul. Mike never expected to be able to work in a place that contribute in some small way for the parish to evangelize with such a high-quality product. It’s satisfying to know that someone might bring a bulletin home that gets picked up and brings them back to church. Paul said ParishComm was a family business to begin with: Paul, his wife Christine, his son Stephen, plus a couple of guys he met on Cursillo. But it was through involvement in St. Basil’s that he found people who needed work and they hired people to help. 2nd segment: Scot said one year ago, after conversation between Paul and Scot, they decided it would be in everyone’s best interest for the Archdiocese of Boston, through Boston Catholic Television Center, Inc., to buy ParishComm. Cardinal Seán determined that it would be helpful to parishes to raise the bar on the quality of bulletins. Paul said there have been 15 new parishes added in the past year and there are 47 more who would like to come on board when their old bulletin printing contracts expire. Every parish is different and Paul goes out to all the parishes to find out what they need and what they’d like. Scot said Cardinal Seán was interested in having a communication tool like the bulletin that reaches more Catholics every week than any other of our communications tools. 300,000 people go to Mass every week and most pick up a bulletin. Scot said pastors tell him that fewer bulletins end up in the parking lot or on the floor because the quality is higher and people want to bring it home. Mike proofs every bulletin every week. Scot asked what is the most frequent content he sees. Mike said he sees parishes put in calendars of everything going on in the parish. He said parishes also take advantage of the full-color glossy covers with provided artwork relevant to the current week’s Gospel or the time of the year. Many parishes used 9/11-related covers this week. Mike said about 35,000 bulletins are printed in a two-day span at the Pastoral Center. That’s about 20% of all parish bulletins in the Archdiocese. Scot asked Paul why he was interested in becoming part of a broader archdiocesan communications effort. Paul said he came to understand that we’re called to do more than make a buck for a living. He realized that there’s plenty of work to do in your own backyard and while they were very strong in the North Shore where they were based, they were looking to expand. Now they’re growing rapidly on the South Shore and even beyond the Archdiocese. Scot said new bulletins are being printed in the last couple of months for Boston University Catholic Community, St. Joseph in Kingston, St. Albert the Great in Weymouth, St. Thomas Aquinas in Bridgewater, Sacred Heart and Our Lady of the Assumption in East Boston, St. Ann in Neponset, and Our Lady of Lourdes in Jamaica Plain. That’s a lot for just a couple of months. Paul often goes to a parish for the first week of the bulletin. He sees people wowed by the cover and then they see how the bulletin’s content has changed to become more informative. Paul said the sponsors love the bulletins because the color ads project their brands better, so now it’s not just a donation to the local parish, but it’s a way of supporting their business to..
3rd segment: Scot said with the acquisition of ParishComm, there was a deliberate decision to create both Pilot Bulletins and Pilot Printing, as a way to help parishes with all their printing needs. Mike said because of the 35,000 bulletins, the volume of work allows the per unit cost of printing to be much lower so they can offer printing to ministries at a much lower cost than through traditional printers, like Staples for 500 flyers. Scot said he was shocked to see the prices most parishes were paying at third-party vendors, even with a little bit of income for Pilot Printing. Mike said they can offer parishes printing in color what they’re paying for black and white at Staples. They also do lots of flyers and it’s not just for parishes that print their bulletins. If they can save the parish $100 for a print job, that $100 can be spent on pizza for the youth group for example. Scot asked Paul about any unusual printing offerings. Paul said they can print banners of all shapes and sizes for very reasonable prices and put just about anything on them. He said its stunning. Scot said many parishes through the archdiocese have had Catholics Come Home banners printed by Pilot Printing. Mike said he talked to a deacon who had ordered a banner of the same kind from someone else and paid $350 instead of the $89 that Pilot Printing was charging. He said the most frequently ordered items are pew cards, flyers, and posters. He just printed 1,000 posters and 1,000 postcards for Lift Ministries. They also print business cards, magnets, and just about anything else. There’s a video showing behind the scenes of Pilot Bulletin. Mike is also involved in a charity called Par4theCure. In 1998 Mike’s friend died of a brain tumor. The following year he rode the Pan-Mass Challenge,and after that started the Par4theCure Golf Tournament and then started the black-tie golf-themed Golf Ball at the Harvard Club. They’ve donated more than $350,000 to brain tumor research over the years. Pilot Printing does all the printing of course. Scot said there’s a mutual benefit for Pilot Printing where some donors have decided to use Pilot Printing. 4th segment: Scot, Mike, and Paul talked the New England Patriots season opening today and their predictions for tonight and the season. Paul predicted Patriots win tonight 31-21 and they are in the Super Bowl. Mike said tonight the Patriots win 24-10 and their record is 13-3. Scot said Miami is difficult for the Patriots, while Miami lost a lot of home games last year. Scot thinks it will be a close game with a 4th quarter nailbiter. He picked 24-21 and said for the season will be 11-5. Scot thinks last year’s 14-2 record won’t be repeated because the Jets, Bills, and Dolphins will be stronger teams this year. They also have a tough road schedule. Paul predicts 12-4. 5th segment: Scot said many of the people working with Pilot Bulletins and Printing have been involved in Cursillo. Paul said he and his wife Christine have sponsored about 50 people over the past 20 years of being involved with Cursillo. Paul said being able to have his children go through Cursillo in their twenties made such a difference for them which Paul didn’t benefit from until his forties. Cursillo is a three-day experience where a sponsor brings you to a retreat center. The experience removes any of the distractions of life to help them let go and start to live the moment and to really hear what the people who are sharing with them are saying about their live an the difference God has made for them. Scot said Mike has been cooking for the Cursillo retreats since December 2000, just a few months since living his own Cursillo. Mike points out that it’s not just for those estranged from the Church. While some, like him, hadn’t been to church for years, many are people who are already devout. Mike has sponsored several of the Daughters of St. Paul on the retreats. Priests have told him that they didn’t truly living their priesthood until going on a Cursillo after 40 years since ordination. To find out more, go to the St. Basil’s website.